p(blue). Culinate editor's note: In addition to building raised-bed gardens, Caroline Lewis's company, Verdura Culinary Gardens, offers hands-on organic gardening lessons and consulting for Portland-area residents. This is the second part of Lewis' two-part story on when to harvest vegetables. The first installment focused on spring vegetables. It's not always easy to know when a vegetable is optimally ripe, nor how much longer it will be OK if you’re not quite ready for it and you want to leave it in the ground. Here are some pointers for harvesting the bounty of summer and fall. Let’s start with the easy ones: tomatoes, peppers, eggplants, and cucumbers, all of which bear fruit easily recognizable to nearly everyone. First of all, understand that your home-grown veggies won’t necessarily look like those you see in the supermarket. They may well be smaller and unfamiliar in color, particularly if you are growing interesting heirloom varieties. We tend to expect eggplants to be purple and tomatoes to be red. We’ve had clients repeatedly fail to harvest their Green Zebra tomatoes because, well, they were still green! Ripe tomato colors range widely, including pink, dark purple with green shoulders, and yellow. Rather than judging by color, try going by by feel when harvesting tomatoes. Ripe ones have some give to them; they’re slightly soft, but not squishy. They will continue to ripen off the vine at room temperature, but they taste best if fully vine-ripened. A green pepper is nothing more than an unripe red, orange, or yellow pepper. If you like them green, then harvest them as soon as they reach full size — which, remember, will likely be smaller than the monster bell peppers in the grocery store. A good bet is to harvest green peppers just as they start to turn color, as they grow to full size first and then start changing colors. If you’d like a mix of green and ripe peppers from your garden, let the earliest, most mature fruits ripen to red and then harvest the rest green. That way, if you live in an area like ours with relatively short summers, you’ll be sure to get at least some fully ripened fruit. Eggplants are ready to cut off the plant when their growth slows and they’re large enough to be useful to you. Let them go too long, and they can become seedy and bitter. I tend to cut them when they’re still relatively young, as I prefer the creamier texture and flavor. I rarely wait until they’re as large as commercially grown fruit. Cucumbers are easy to grow and will often reach full size very quickly. Cut them off the vine as you need them, harvesting the largest fruits first and keeping the plant harvested to encourage ongoing fruit production. Pick zucchini early and pick them often — otherwise, you may well end up with gigantic, seedy, bitter monsters before you know it. It happens all the time: you check the fruit, deem it just a bit too small, and then forget about it for a week. Oops. We pick most zucchini when they're about 8 inches long. But our favorite, Costata Romanesca (shown in the photo), is actually better if allowed to grow to 12 or 14 inches or even longer. It gives us some flexibility (and is also tastier than most zucchini). Regardless of the variety, my best advice is to check your summer squash daily and to err on the small size in harvesting, unless of course you want to bake a big batch of zucchini bread. 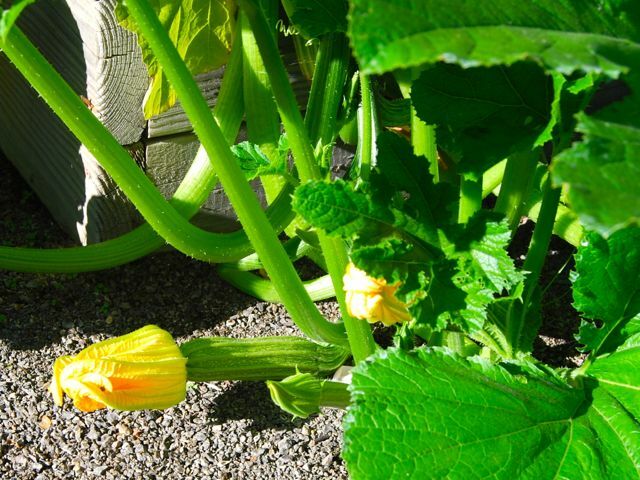 An easy way to time your winter-squash harvest is just to leave the fruit on the vine as the plant dies back in fall. It can be left there until you do your late-fall cleanup. You can harvest it sooner, if it’s full size and has changed color (for example, the pumpkin is fully orange rather than partially green). I never much cared for green beans until I started growing my own, and now I can’t get enough of them. The cynic in me has always wondered if commercial growers deliberately wait to pick beans until they’re large, seedy, and tough — after all, they weigh more that way. I hope that’s not the case, but what I do know is that home-grown beans are a revelation. Picked young, they are tender and incredibly flavorful. 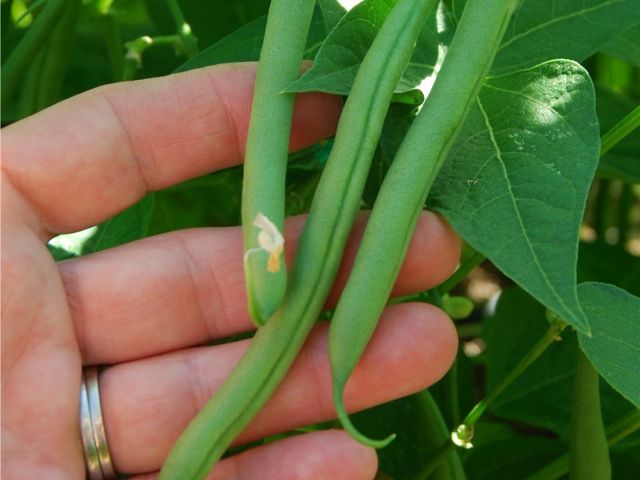 Bush beans bear fruit earlier and have a shorter harvest season than pole (or vining) beans. For filet-type beans (shown here), pick them when pencil-thin. They are most tender before the seeds inside each pod start to mature. As that happens, the developing seeds pull moisture from the pods, eventually drying them out completely. 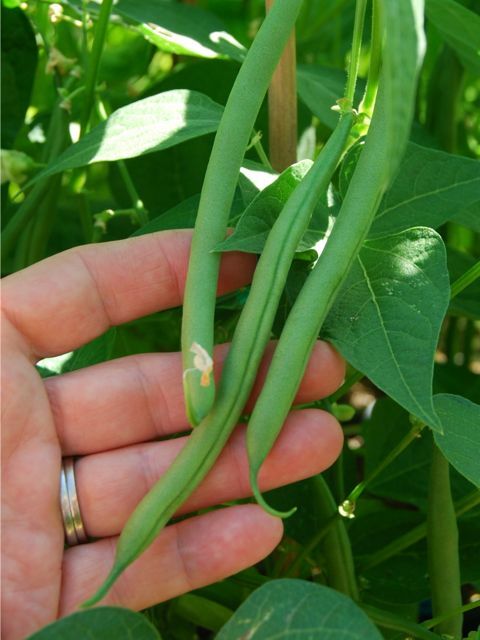 Flat Romano-style beans grow considerably larger than filet beans, with thick, flat pods, but the goal is still to harvest them before their seeds start to mature. If in doubt, cut one open and take a look. With shelling beans ——the kind you grow to dry for storage, like pinto or flageolet beans — the whole point is to let the pods and the beans inside dry out. We just leave these unpicked on their vines until the pods are quite dry, then harvest and shell them. Basil is a very tender annual. Unlike perennial herbs such as oregano and sage, basil will last only until the first frost. Our goal over the course of a basil plant’s short life is to prevent flowering and to harvest the maximum number of leaves over as long a season as possible. Removing flower buds and upper leaves prevents flowering and forces the plant to become bushier and produce more harvestable leaves. So we harvest basil by pinching or snipping off the top leaf sets as they grow, trying to harvest them before the green buds open into white flowers. Left uncut, those flowers indicate to the plant that it’s time to wind down and stop production. Spring-planted onions typically don’t mature until August or September, and leeks take even longer. Leeks are often not harvested until well into the fall months, and hold well in the ground for a number of weeks, sometimes even all winter long in milder climates. It takes many weeks for them to grow to a usable size. They can certainly be harvested earlier, but will be smaller. Be sure to harvest onions immediately if you see flower stalks, as bolting onions become very tough. Onion bulbs will typically pop out of the ground when they’re approaching maturity. Once their leaves start to die, turning brown and flopping over, the bulbs are ready to pull. We lay the entire plant out on newspaper in a cool, dry place for a week or two before trimming off the roots and leaves for storage. Green onions or scallions are a little more flexible; once they’re established and are a decent size, they can be harvested individually as you need them. Eventually, they’ll form small bulbs, but are still usable as green onions.